Southern as Biscuits: Silhouette Giveaway! This little rabbit has a garden that would make Mr. McGregor green with envy. This is an original hand cut silhouette by Cary, mounted on white illustration board. Measures 5 x 7 inches for easy framing. I love a giveaway! Wouldn't this darling silhouette be just perfect for a children's room? Reading room? Any room? Cary Canary is a local artist here in Winston-Salem. You might remember seeing some of her crafty works here on the SouthernAsBiscuits blog in the "Local Etsy" section. 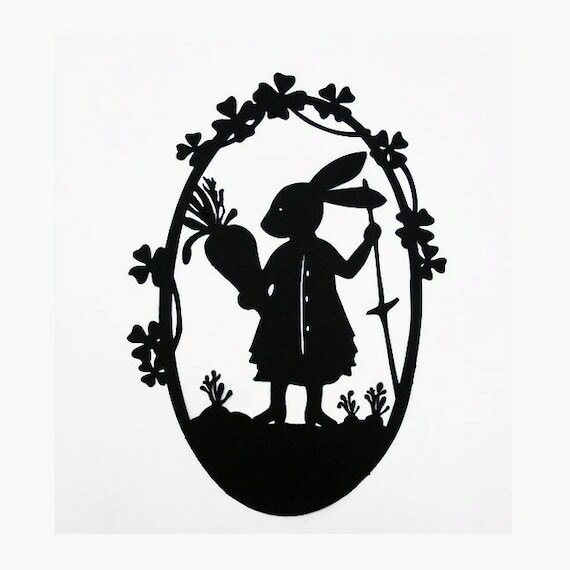 Cary designs each of her whimsical silhouettes and cuts them by hand. She also does custom silhouettes. I love the Alice in Wonderland inspired pieces, as well as the nutty tea party, and well, all of them. This little bunny can be yours! Just click HERE to visit Cary's Etsy shop, then come back and comment below to tell me which is your favorite silhouette. Monday, May 16th, one of the commenters' names will be chosen by random.org to receive this one-of-a-kind artwork! Thanks for being a Southern As Biscuits blog reader! LOVE LOVE LOVE CARY AND HER WORK!!! Thanks for commenting! Please send me your name so you can be included in the drawing! Hare and Rabbit's Nutty Tea Party. These make me smile. I love the shamrocks around the edges of the pic! The blackbirds reminded me of old nursery rhymes not so popular today, but worth remembering. I'd love to be entered in the contest. Oooh - I like all her stuff! I especially like the custom horse sill the best! Rabbit and His Four Carrots--I like the suggestion of a story in that title. My favorites are the Nutshell scenes. Do I have to choose one? And the winner chosen by random.org is...... Wendy Moraes! Congratulations! Message me your address and I will get it to artist Cary Canaray asap!